Lucy and Maria met whilst studying for Masters Degrees at the Guildhall School of Music and Drama. 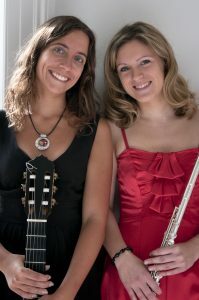 They both graduated with Distinction from their studies, and since then have worked together in a number of projects, including the UK Premier of the Spanish composer Feliu Gasull, and have performed many recitals in London, around the UK and abroad together. They present a captivating and eclectic programme, formed by traditional repertoire, original compositions and new transcriptions. Their performances include classical, Spanish, Latin and jazz influences: works by Bach, Mozart, Granados, Gaubert, Walton, Piazzolla, Mompou, Gasull, and new works. 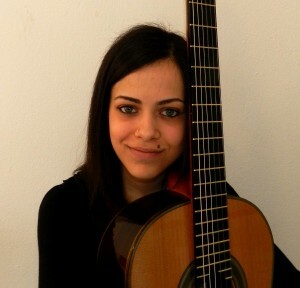 Renata Arlotti was born in Italy and began studying classical guitar in her home town of Sassari, before continuing in Milan under the guidance of Professor Lorenzo Micheli. She continued her studies with a Bachelors Degree at the Conservatoire de la Vallée d’Aoste, graduating in 2011 with highest honours. In 2013 she graduated at the Conservatorio della Svizzera Italiana in Lugano, in the class of Lorenzo Micheli with a Masters in performance. In the same year she was invited to play at the XVIII meeting of the International Conference on Guitar in Alexandria. In 2013 she was admitted to the prestigious Royal Academy of Music in London, where she is currently attending a Masters Course in performance with Professor Michael Lewin.